A positive user experience is key to user retention, a higher domain authority, and overall higher keyword rankings. But if your user experience is different on desktop than it is on mobile, you may be missing out on opportunities to get optimal rankings. Mobile-first indexing is here to stay, and building a compatible and SEO-friendly mobile website is more important than ever. 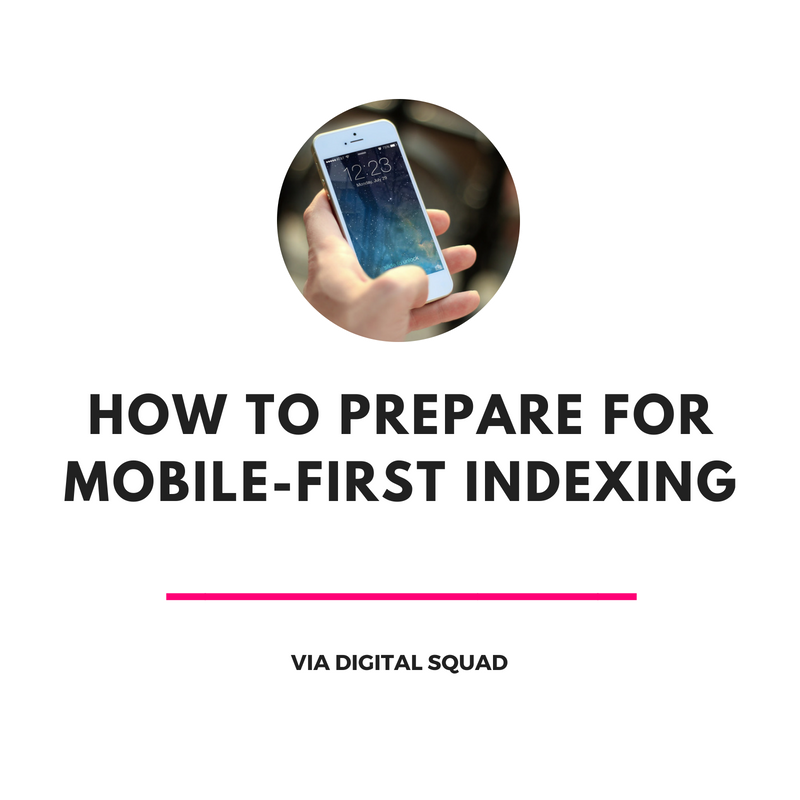 Use this post as a guide to understand what mobile-first indexing means and what steps your business needs to take to ensure you have the highest rankings for your website. Mobile-first indexing is a process that prioritises the way that users view a website on their mobile devices. Previously, Google assessed websites based on how they appeared on a person’s desktop. If the website looked good on a desktop, it was more likely to appear on SERPs. But this process didn’t account for how these websites looked on mobile devices. High-ranking websites had the potential to turn mobile users off. Google has noticed these issues and in 2016, started to experiment with mobile-first indexing. Rather than looking at the desktop version of the website first, mobile-first indexing looks at the mobile version of the website. This process helps users see the best websites on their mobile devices, improving their overall experience on Google. As the year goes on, Google will start to expand their mobile-first indexing efforts. If you haven’t already looked at the way your mobile website affects user experience, it’s time to get to work. Take a quick look at how your website is currently set up. If you don’t have a mobile website set up, don’t panic. This is not a mobile-only indexing. When Google sees a website that only has a desktop version set up, they will revert to assessing and ranking that site. Mobile-first indexing just changes Google’s priorities to focus on a website’s mobile version. If your website has a responsive design, you should be okay as well. Responsive designs adjust your website for mobile and tablet devices, and don’t require a separate URL that is specific to mobile websites. But you still could benefit from giving your mobile site a look and testing its compatibility. Your theme may need an update to adjust to current mobile devices. The switch to mobile-first indexing follows trends in how users search on Google. A majority of queries are made on mobile devices; in fact, Google reported that the number of mobile search queries topped desktop queries in 2015. Mobile compatibility is especially important if you are prioritising local SEO strategies. Customers searching for local businesses are more likely to search on mobile. Data has shown that customers will use mobile devices to search for products and businesses even if they are in the physical store itself. A troublesome mobile website could lose you money; 46% of customers who experienced interruptions during a first mobile purchase have said they will not make a second purchase. Four out of ten online purchases are conducted on mobile devices, so ecommerce businesses should pay special attention to mobile compatibility. And mobile does not just affect your website. Your social media pages are more likely to be viewed on mobile, no matter which platforms you use. Studies show that 60% of LinkedIn traffic comes from mobile; 85% of time spent on Twitter is on a mobile device; and 80% of Pinterest traffic is from mobile devices. Since the platform itself takes care of mobile compatibility, you won’t have to do much work here. This statistics are still important to remember; if your social media profiles are driving your overall website traffic, more users will visit your website on a mobile device. The Google Search Console is your best resource on how Google will assess and rank your page. Just type in your URL and let Google do the work. The results will show you a screenshot of your site on a mobile device along with basic issues that prevent your site from being compatible. Think With Google takes you one step further to evaluate compatibility and speed. Your results will include how fast it takes your website to load on mobile and what that means for user retention and bounce rates. Think With Google also provides more in-depth suggestions on how to improve compatibility and page speed. If you have conducted a site audit on SEMRush, you can gather further data on your mobile site. SEMRush can show you which of your URLs are labeled as “mobile-friendly” and how your keywords rank for Google mobile search results. All you need to do is switch the SEMRush overview from Desktop to Mobile and read your results. When you are testing your website’s compatibility, make sure you are instructing the software to assess your website as Google would assess it. It is obviously important for your users to access your website, but if Google can’t, you won’t be able to rank. Once you test your website, you might see some suggestions pop up on how to make your website more mobile-friendly. The following issues are just basic elements of websites that affect mobile SEO. If you want to resolve these issues, you may have to edit your website’s code and recruit the help of an expert. Page speed is very important for improving user experience and boosting your rankings. Users don’t have to wait around for the content that they want – if your page is taking too long to load, they will just click away and find a faster website. If you want to dramatically increase your page speed on mobile, you can build and validate AMPs that look identical to your current website. Work with an expert to build these pages since you are working with limitations. Some images or videos may only appear on desktop devices due to restrictions from Flash. These restrictions will appear as errors when Google crawls your website. If you have multiple URLs for mobile and desktop websites, you might be sending some mobile users to 404 error websites. A full site audit of online behaviour and the journey users take through mobile and desktop sites can reveal any 404 errors that are specific to mobile devices. Make sure each page is directed to the appropriate mobile website. This should not be a problem if your website is responsive. If possible, build a website using a responsive design that takes the work out of ensuring that your site is compatible. If you do have different mobile and desktop versions of your website, make sure your metadata and structured data is equivalent. Look at the page titles and meta descriptions for each version to ensure consistent rankings. This is just a reminder that even if your website is technically sound and you’ve checked off everything you need to create a compatible website, your work isn’t done. The content still needs to be relevant to search queries. Google will still show a less-compatible website if the content is more relevant to what users want to read. If you are not prioritising content in your overall SEO strategy, your website may not reach the rankings you want. …but in order to rank for the keywords that will drive traffic, you need to continuously work to improve your website across all devices. A comprehensive SEO strategy requires a full site audit that evaluates user experience throughout multiple visits and using multiple devices. Learn more about building a strong SEO strategy from the experts at Digital Squad.